Did you ever consider that delivering an outstanding presentation is like performing a great song? Not only is the “music” delightful to listen to, but your voice soars on a combination of dynamic technique and an inspirational message. The way you use your vocal tools carries astonishing weight with regard to credibility, authority, and that all-important attribute, believability. Why does your voice alone make such a difference? Well, for one thing, we all respond in basic, even primitive ways to the qualities of a person’s voice. If a voice is pleasant and authoritative, for instance, it may inspire confidence in the listener. But if it comes across as unpleasant, weak, or too quiet, the speaker will have difficulty persuading the audience toward a sale or any other positive response. 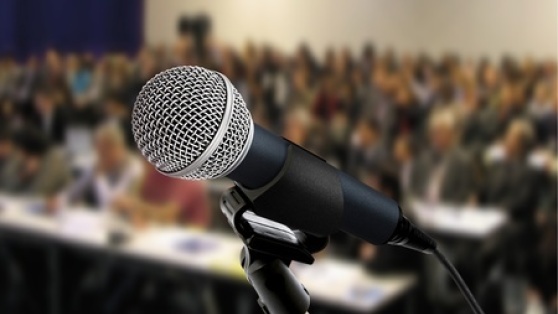 Vocal dynamics is one of the most powerful tools a presenter can use to win over an audience. Tone quality, pitch, inflection, emphasis, variety in pace, pauses, and all the emotional nuances our voices can project offer a nearly limitless palette to paint our “word pictures” and convince others. When you use this techniques, you make your story, whatever it may be, come vibrantly alive for your listeners. Another effective way to approach your full vocal potential is simply to remember that the voice is inherently physical. That may sound obvious, but it’s easy to become so focused on your presentation’s content that you forget this essential fact. Your voice is intimately connected to breathing, energy and relaxation. Any relaxation exercises—yoga, meditation, or simply lying down to rest—will help free your voice from the tension that comes from a busy life. Distractions in life naturally take their toll on how you express yourself. Although it’s not always noticeable, the tension in your daily life reflects not only in your body but in your voice. Your voice therefore functions most fluidly and powerfully when you relieve these daily tensions. For the third technique, remember that to be convincing, you must combine the use of your voice with what you are saying. Beautiful words that don’t sound meaningful will not convince people. The converse is true as well: Heartfelt emotion presented without eloquence can come across as merely clumsy. Content’s power and effectiveness hinges on your ability to combine it with the quality of your voice and your nonverbal communication. When you look and sound good while offering the audience a message worth listening to, all the components will be in place. Finally, once you’re aware of the potential of vocal power, you can learn how to use vocal subtlety to influence your audience. The suppleness of your vocal instrument is a factor too easy to neglect. The voice is the perfect tool to build trust, to instill confidence in a product or service, or to create excitement among potential clients or investors. The key to this effect is practice. When you’ve practiced enough to smoothly use your vocal tools in your presentations, remember a last point: Your listeners must trust and respect you, which means you must have an honest conversation with your audience. Be yourself—which really means speaking and moving like yourself. Such authenticity looks and sounds like honesty to an audience. Also, be sure to keep good eye contact with audience members at all times. Look them in the eye and use your voice to persuade them of your cause. While remembering to pay attention to your nonverbal cues and the subtleties of your voice, remind yourself at all times as well to respect your listeners' intelligence and opinions. Do these things and you’ll have standing room only for your next “performance.” For effective communication as well as leadership skills, you possess no more powerful tool than your voice.